Surprise friends and family with our special gift cards! Are you looking for a way to express your gratitude, affection and generosity to your friends, family or colleagues? What better way to express your feelings with a Nomads Gift Card? 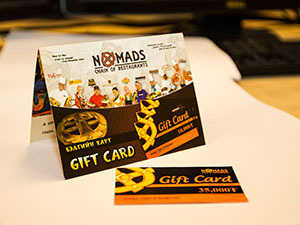 Go to any of our Nomads Chain of Restaurants and get your gift cards. We offer 3 different gift cards worth up to 20,000, 30,000, and 50,000. Your loved ones can head over to any of our Nomads Chain of Restaurants for a tasty meal and comfortable environment any time they want!